Stunned by her friend's murder, private investigator Darcy McClain is determined to hunt down Sean's killer. In shock, she returns home to find someone has broken into her home, assaulted her sister, and stolen Bullet, her giant schnauzer. After Sean's death, more grisly murders follow, leading the police to suspect a serial killer. Darcy isn't convinced. But before she can pursue her hunch, she is framed for Sean's death. On the run from the law, she's forced to go underground to solve the murders and to get Bullet back. In the course of her investigation, she is astounded to discover evidence of a high-level government conspiracy to exterminate gays and lesbians. Thousands are already dying horrible deaths. Is Solis part of the conspiracy? Is he the murderer? Taunted by Solis, who threatens to kill her dog, Darcy vows to track down her adversary, save Bullet, and discover the truth. Meet The Carver—Albuquerque's most brutal serial killer. 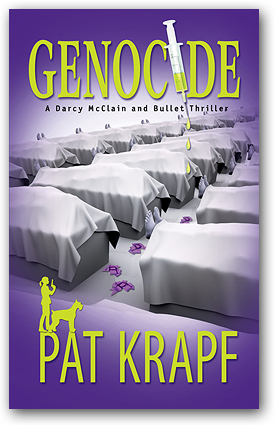 Only one person can end his carnage—Darcy McClain. That is, if he doesn't kill her next. Since her parents' deaths, former FBI Special Agent Darcy McClain has leaned on lifelong friend Randolph Colton, but now he has his own battle to fight. Severe cuts in the government's defense budget have forced his company, Colton Aerospace, to downsize. On the verge of bankruptcy, Randolph learns Capitol Hill has awarded his firm a contract to manufacture a high-powered laser for the air force's next generation of bombers. However, his euphoria dies when he discovers a crack cyberspook has penetrated the firewalls of Colton's classified databases. If the Department of Defense discovers the security breach, they will yank the contract. Randolph calls in the one person who can catch the hacker: Darcy. Before the investigation even begins, Randolph is murdered, leaving Darcy to wonder if the killer and the hacker could be one and the same. While she stalks him through the electronic corridors of Colton's restricted operating systems, The Carver, a man indelibly scarred by his horrific past, methodically continues to exact his revenge on the Colton family. He vows that no one will stand in his way, not even Darcy McClain. But the shocking secret that drives him to revenge is something only she can uncover. Darcy McClain has discovered unbelievable atrocities hidden deep within the basement labs at Los Alamos, and she can’t escape . 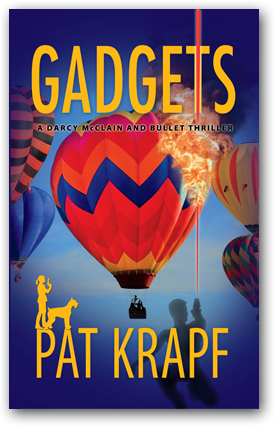 . .
Former FBI Special Agent Darcy McClain and her sidekick Bullet, a giant schnauzer, are in Taos, New Mexico, when they stumble upon a flash drive in an arroyo on the property she’s inherited. The drive belongs to Los Alamos National Laboratory (LANL). Darcy pockets it and hikes to the adobe on her land. There, she finds a pregnant teenager, Rio, searching the house for the drive, as the USB is a possible clue to the whereabouts of her missing fiancé Johnny, who works at LANL. Rio is frantic to locate him. In a strange coincidence, Darcy learns Rio is the daughter of a family friend, and bound by this bond, she agrees to help the woman find Johnny. 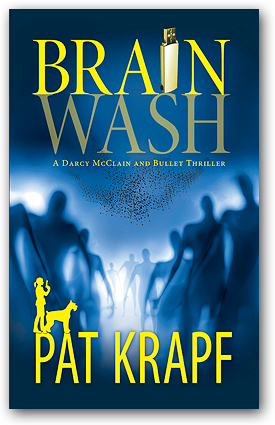 What begins as a missing person’s case soon escalates into a dangerous game that places Darcy’s life at stake after she infiltrates the top-secret biotech labs at LANL, where shocking neuroscientific research soon comes to light.